Kerr Pump & Supply is proud to introduce Milton Roy, a new line of metering pumps, process pumps and mixers. Milton Roy pumps are highly reliable some lasting over 30 years. 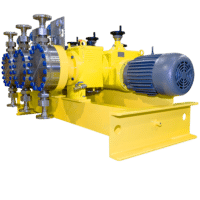 Benefits include extended pump life cycles, minimal downtime and lower maintenance costs as well as API 675 standards. Get all the details and download complete metering pump information on our Milton Roy page.